Old hand-written letters often contain a wealth of fascinating information. 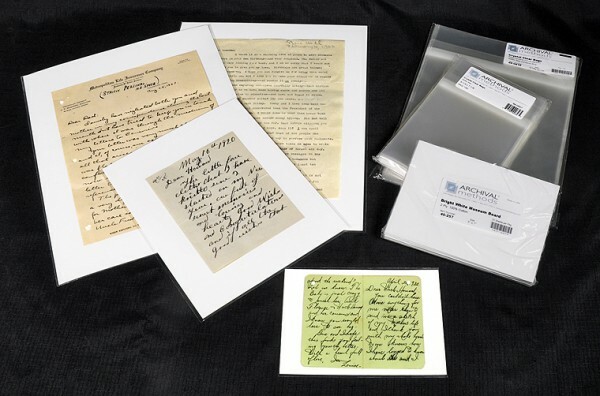 From correspondences preserved in presidential archives all the way down to letters your grandparents may have exchanged while courting back in the day, all are worthy of the highest level of archival care. These days, so much of our communication is done using technology. Times aren’t what they used to be, and we would rather text or email rather than sitting down to write a letter. Unfortunately, these methods of communication leave very little behind, causing others after us to never really know what our life was all about at any given moment. Archivists from the Montana Historical Society recently spoke to The Great Falls Tribune about a series of letters they have preserved from a young 25-year-old man named Pat Blinn. While serving overseas in the Pacific Theater during World War II and later in the Korean conflict, Blinn wrote several letters to his love back home, Betty Ann Gaston of Missoula, Montana. Sometimes he wrote about his travels during these wars, but mainly he discussed missing home and missing his sweetheart. Sadly, while serving in Korea, Blinn was killed in combat and his remains were never recovered. A typical World War II-era letter, postmarked December 4, 1943. Many patriotic-themed envelopes and stamps were created during this period, thus the “Liberty Above All – For All” color imprint, and the “V for Victory” stamp. 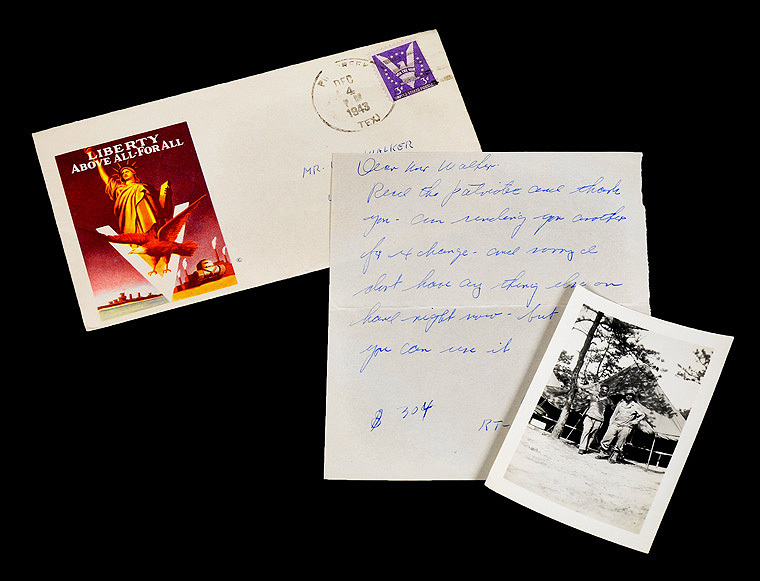 Nestled inside this envelope, almost as fresh as the day it was mailed, was a hand-written letter and a photograph of two soldiers. This family artifact has survived intact since the middle of the last century, and it is our job as family archivists to make sure it survives well into the next! Although Blinn is gone, his words still remain thanks to proper preservation techniques. The archivists at the Montana Historical Society have noted that while the ink Pat Blinn used is a bit faded now, making the words slightly harder to read, the message is still clear. Any reader can understand the genuine love and affection that Pat had for Betty Ann and for his family and friends back home. The letters also give historians an inside look to what life was like in the military during World War II and the Korean War. Nowadays, very few people would think to write out a letter to a loved one or friend, as they’d much rather type it into an email or text. This method of communication, however, doesn’t hold up nearly as well over time, as more often than not these writings are eventually deleted. Writing letters is considered a lost art these days, especially those written in cursive. Many of the younger generations don’t even know how to read cursive, let alone write it themselves. While writing hand-written letters was the norm during Pat Blinn’s time in the military, those individuals serving overseas today who wish to communicate with family, loved ones and friends more often than not choose to Skype them or use some other form of video chat— important modes of modern communication, but forms that just can’t be saved. Archivists from the Montana Historical Society are worried about this. They noted that unlike their current role as preservationists of “hard copy” letters, documents and artifacts, archivists of the future may have to be hacking gurus who can slowly break apart hard drives and computer accounts of people’s emails and messaging services if they ever want to have access to the same sort of historical material currently preserved in old letters. Various types of old letters. Note the different levels of “formality” in these letters: a typed letter (left); a hand-written letter on company stationary (right); and informal hand-written notes (bottom). Each of these styles reflect aspects of “how” the contents of the letters were communicated. Fascinating! These letters are all stored in archival 3-ring protective pages, which allow one to read the front and back of each letter while protecting it from handling, dust, finger oils, etc. These pages can be placed in high quality 3-ring binders (see below) for safe, easy and quick access. The physical appearance or “presence” of communication has also changed throughout the years. In the past, people may have written letters and accidentally shed a tear on the note, or sprayed their favorite perfume on a letter to remind someone of their scent. Perhaps a lock of a loved one’s hair or a pressed flower might have accompanied such letters. In today’s digital world, none of this can be done. Everyone also has the same “handwriting” when it comes to typed-in digital correspondence, and therefore changes in tone and emotion can’t be conveyed as easily as they can in a written note or letter. This being the case, family members and historians of the future may have a harder time figuring out exactly what we were trying to say to each other, how our lives unfolded, and what was important to us. Fortunately, though, we do have old letters like those Pat Blinn wrote to his love Betty Ann all those years ago, and those are absolutely worth preserving! If you have a trove of letters in your family archive, or notes that perhaps you yourself wrote or received from a loved one, or are interested in bringing back this lost form of communication, consider the following tips to help preserve these wonderful treasures and this lost art. 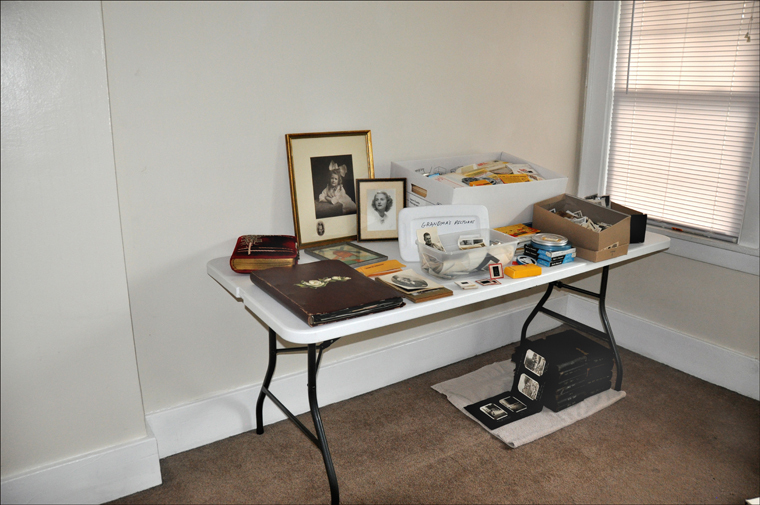 A dedicated workspace for sorting and archivally storing old family letters, photographs and artifacts. Before you open that old shoebox full of letters that have been stored in the attic or basement, clear off the dining room table or set up a space in an unused corner of the living room in order to spread your collection out. Always wash your hands before handling old letters, photographs, and documents, as you don’t want to damage these irreplaceable artifacts with dirt, lotions or the naturally-occurring oils on your hands and fingers. And, as a perennial rule of thumb, never have food or beverages near your old letters and artifacts, as an accidental spill could spell disaster. Consider placing your letters and documents in acid-free envelopes, archival crystal clear bags, or three-ring page protectors, all of which will keep delicate papers from being exposed to harmful dust, moisture and household pollutants. Depending on how many letters you have, you can place them in elegant three-ring binders and slipcases if they are in 3-ring page protectors, or in acid-free boxes that come in a variety of sizes, depths, and colors to match any taste or decor. You can also keep your letters safe in acid-free file folders, or a document storage kit, which has everything you need in an all-in-one kit. 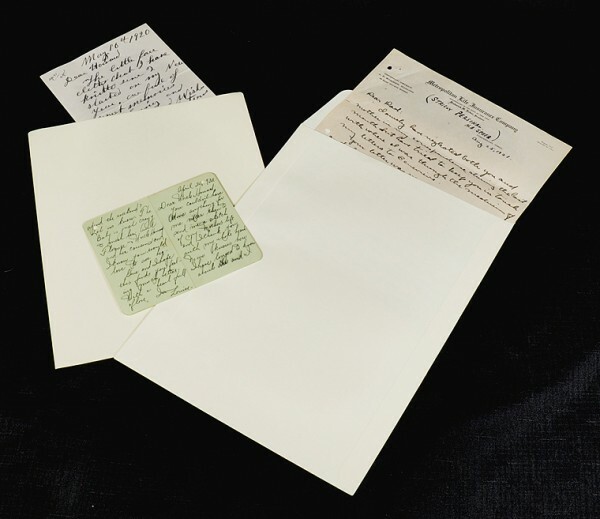 Old letters safely stored in archival, acid-free open-end (left) and flap (right) envelopes. Letters stored in clear, resealable archival crystal clear bags with 2-ply acid-free mat board backing for strength and stiffening. 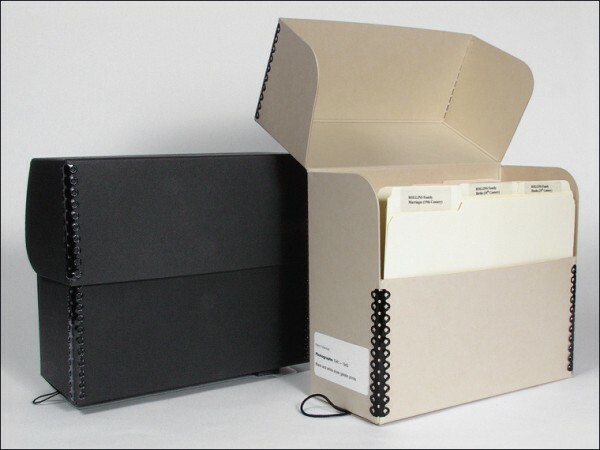 Collector-grade three-ring binder for safely storing archival page protectors. Dozens upon dozens of old family letters and documents can be stored in a single album. 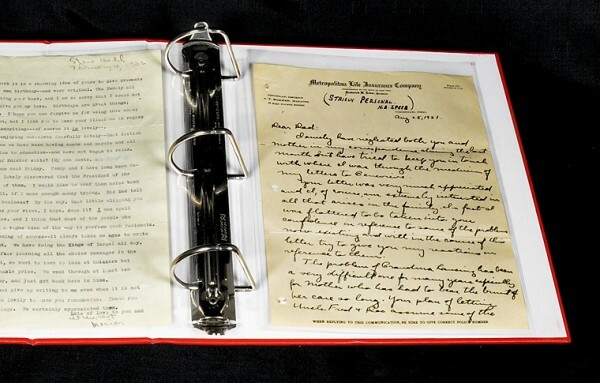 Three-ring archival pages provide front and back visibility, and protect against dirt, moisture and fingerprints. 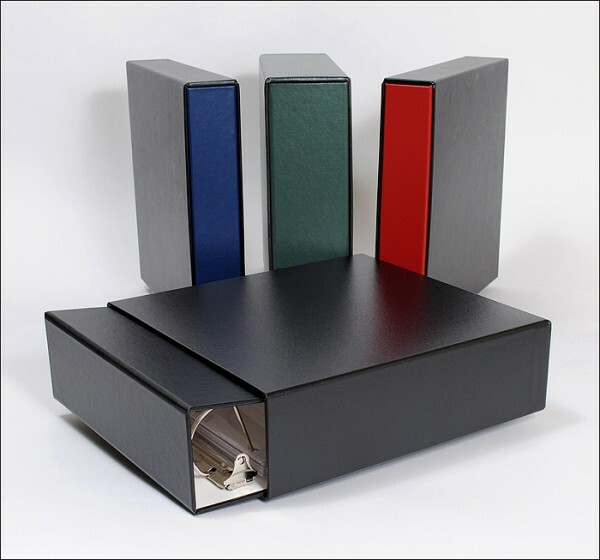 Elegant slipcases for storing 3-ring binders add an additional layer of protection from dust, household pollutants and moisture. Beautiful to look at on a shelf, too! This document storage kit includes everything you need for archivally preserving old letters, and is available in three different colors to match your tastes and decor. As noted by the Practical Archivist, keep all of your historic and contemporary letters and documents in a cool, dry, dark place away from excess humidity, water and light. 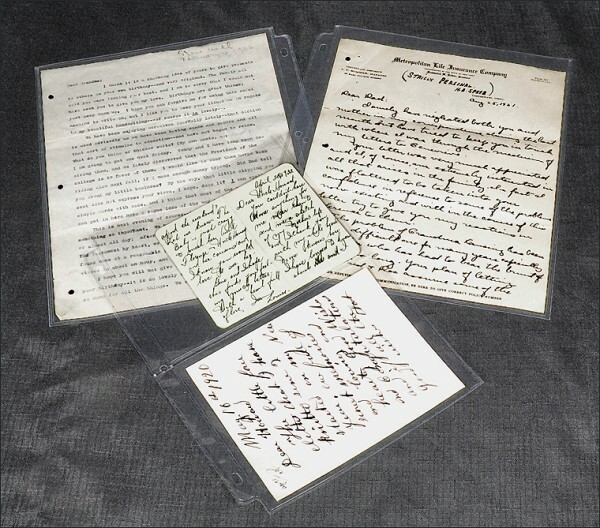 While perhaps stored for years in the attic or basement, these locations are not ideal for preserving old letters as the wide fluctations in temperature and humidity can harm papers, inks, photographs and other such artifacts. 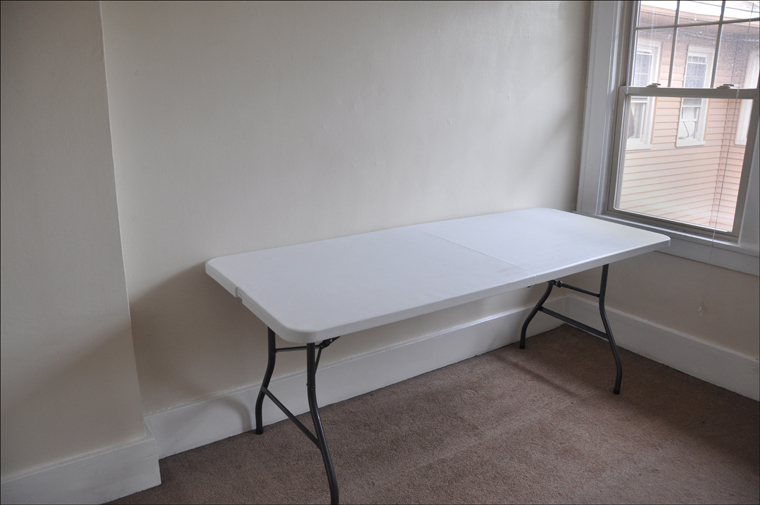 The ideal place to store a set of letters is in an indoor closet or shelf (away from direct sunlight) in your “living space,” not the attic or basement, as the temperature and humidity variations are less drastic. This storage placement will also prevent excess moisture from wrinkling the pages or perhaps causing the ink to run, and the lack of excess light will keep the letters from fading over time. 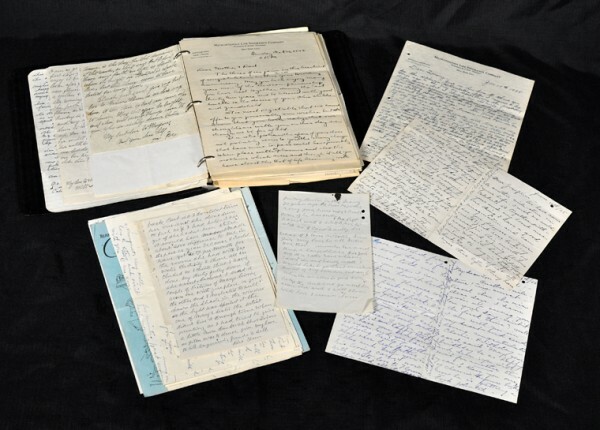 If you have any additional questions on preserving old letters or would like more information on the archival storage and presentation materials that are right for you, please contact us here at Archival Methods. We’re always there to help with any archiving, storage, or presentation questions you may have.